With The Black Dagger Brotherhood series now on its 16th Instalment, other series begin to flounder at this point. It is true that I didn’t enjoy the last book as much as I hoped, I held out hope that this would be good, for it was centring around the Former Crime Lord, Assail and his destined mate, the human thief Sola. Whether it is down to my expectations of the series not being high as they used to be or because it had been so long since I had read a book in this series, but I ended up really enjoying this book a lot. 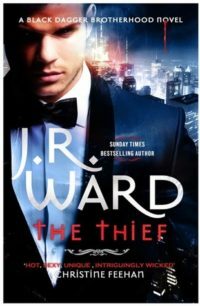 The Thief, like many other books in the series, has a number of plot-lines running through the it. Not only was it about Assail and Sola getting together, it also picked up the previous books plot-lines on Throe and his quest to overthrow Wrath from his role as King, and the distance that was growing between Jane and V.
Though these three storylines at first, don’t seem to be easily linked, Ward quickly and with a such expertise, that for the first time, in a long time, I didn’t find myself skipping parts to get to a certain plot-line. Assail and Sola getting together has been brewing for a while now and even though Sola had left for her own safety, we knew that she would come back to Caldwell. This is under false pretences, but it was nice to see the two of them getting to know each other all over again. Like any good romance, it needs some conflict that puts this in jeopardy. The fact that Sola doesn’t know that Assail and his cousins are vampires should be enough of a bump in the road to Happy Ever After. Ward decides to throw in the sister of a former associate of Assail, out for revenge as an extra bit of something. The other plot-line, which I am going to be honest with you had me really angry, was the apparent breakdown of the relationship between V and Jane. Going into The Thief, I was really apprehensive and after a few chapters, my fingernails were down to stumps due to what was happening on the page. The last time I felt like this was when Channing Tatum and Jenna Dewan announced they were separating. I have to admit, this storyline was written really well, even though I was so close to tweeting Ward at my outrage of the demise of this relationship. OK, so I have always been a V/Butch fan, but I have grown really fond of these two. There are a number of other sub-plots in this book, that could take ages to discuss. When looking back, I can see how all these little strands are leading somewhere and I do look forward to seeing where these are heading. The one sub-plot that really shows promise is the rise of a new threat to the Brotherhood and the fact that it appears that it is no longer the Omega the person that they should be worrying about. Though I do still think that the person who has their eyes set on a coup is a puppet for someone we are yet to see. The series does seem to have a lot of traction left in it and I do wonder where it is heading to, especially with the hints and teasers that Ward keeps letting slip. Now to wait till next year for the next book in the series. Thought it had seemed the series was growing a bit stale, but The Thief has taken a small step towards redemption. The fact that this is 16 books into the series is a very good achievement. Ward looks like she has got another burst of inspiration and the series has a promising future. Assail and Sol’s romance is one of the highlights of the book, but those who love V (like myself), will find his storyline just as much of draw. This book is proof of why Ward is held in such high esteem among the PNR readers. Just when you think you are out, she pulls you back in and frustrated at having to wait for more.